ETHAN COUCH, WHO as a 16-year-old driver drunkenly struck and killed four pedestrians but dodged prison after suggesting at trial that his irresponsibility was a result of his entitled upbringing, walked free today after serving almost two years in a Texas jail on a parole violation. Couch, 20, was released from the Tarrant County jail near Dallas this morning, according to Tarrant County sheriff’s spokesman David McClelland, who provided no other details. It was not immediately clear where Couch went after leaving jail. The group Mothers Against Drunk Driving issued a statement calling Couch’s short stint in jail “a grave injustice to the victims and their families who have been dealt life sentences because of one person’s devastating decision to drink and drive”. Couch was charged with manslaughter after the June 2013 crash. A psychologist at trial blamed the teen’s irresponsibility on his family’s wealth, dubbing it “affluenza”. A juvenile court sentenced him to 10 years of probation. That probation was revoked in 2016 after he attended a party where alcohol was served then fled to Mexico with his mother to avoid punishment. Couch’s attorneys, Scott Brown and Reagan Wynn, issued a statement today saying Couch has always been sorry for what he did. “From the beginning, Ethan has admitted his conduct, accepted responsibility for his actions, and felt true remorse for the terrible consequences of those actions,” they said, adding that he will serve the remaining six years of his community supervision under the terms imposed by the court. Those terms include wearing a tracking device, sticking to a 9 pm curfew and taking regular drug tests, a court filing shows. His mother, Tonya Couch, is in jail awaiting trial on charges of hindering apprehension of a felon and money laundering after she fled to Mexico with her son in 2015. Fred Couch, Ethan’s father, was sentenced in December 2016 to a year’s probation for falsely identifying himself as a peace officer. He has not commented publicly on his son’s release. 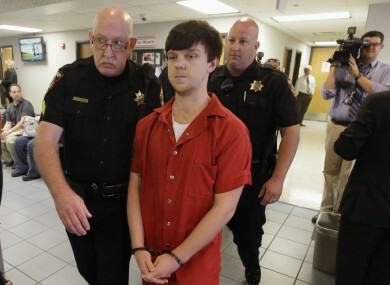 Email “'Affluenza' man who dodged heavy sentence after killing four in road crash released from jail”. Feedback on “'Affluenza' man who dodged heavy sentence after killing four in road crash released from jail”.